How would Congress stop Narendra Modi? Beginning a post with that question suggests there is now going to be some kind of an answer. Well, there won’t be one here. It’s hard to eat your own words when you’re already choking on humble pie. Having been force-fed a steady diet of both over these last few weeks, Congress must dispense with any more remarks related to Narendra Modi. I am referring to a classist remark by Mani Shankar Aiyer against Narendra Modi that a Chaiwala (tea vendor) cannot become Prime Minister of India. This jibe is an insult to not just Narendra Modi but to the entire Indian community who believe in equality and merit. While the remark reflects politically demoralised Congress’s arrogant mindset, it raises compelling questions – Whether Prime Ministership of India an exclusive club of privileged? Should the humble beginning and poor socio-economic background be the impediment for the best man to become Prime Minister of India? What about millions of Chaiwalas of India who work tirelessly with no recognition of their utilities, but have been subjected to condemnation by ill-thought remark by Congress? In sheer arrogance, Congress seems to consider government of India is rich man’s club headed by a single family. At the heart of this is Narendra Modi, the man who has flair of turning diatribes directed at him into opportunities to connect with voters. Chai pe Charcha has captured collective imagination of Indians around the world like never before. Chai pe Charcha is acquiring movement of national consciousness. The last few weeks Narendra Modi has interacted with millions of Indians over a cup of tea at tea stalls through giant video screens in over 300 cities. 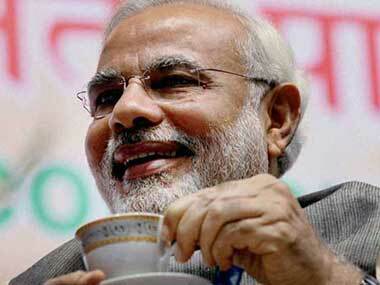 Over a 23 kilometres stretch on Ahmedabad – Mumbai highway ‘NaMo’ tea stalls have cropped up. In a country like India, over 90 percent of work force is involved in unorganised and informal sector such as tea stalls, Narendra Modi has struck a personal chord with them and been able to carve out a formidable constituency for him. This is the politics returning to basics, and supremely effective.